If any malfunction is found, immediately disconnect the battery cable from the negative terminal. Crank the engine and check that the engine starts. Does the engine start? YES >> GO TO 2. Check that the starter motor stops after starting the engine. NO >> Replace magnetic switch. Check that the engine runs at cranking. Does engine turn by cranking? YES >> GO TO 4. Check that the engine speed is not low at cranking. Does engine turn normally? YES >> Check ignition/fuel system. NO >> Check charge condition, corrosion and connection condition of the battery. Refer to PG-113, "Work Flow". Check that the starter motor runs at cranking. Does starter motor turn? YES >> GO TO 6. 2. Check that the gear shaft of starter motor rotates. Does gear shaft turn? YES >> Check pinion clutch. Refer to STR-24, "HR16DE : Inspection and Adjustment" (HR16DE) or STR- 30, "MR16DDT : Inspection and Adjustment" (MR16DDT). 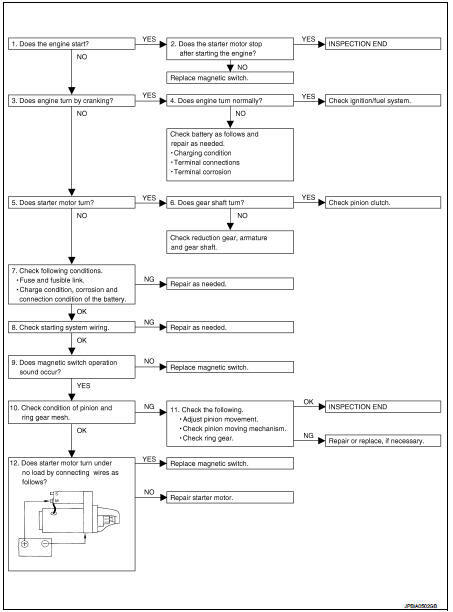 NO >> Check reduction gear, armature and gear shaft. • Charge condition, corrosion and connection condition of the battery. Refer to PG-113, "Work Flow". Are these inspection results normal? YES >> GO TO 8. • “B” terminal circuit. Refer to STR-17, "Diagnosis Procedure". • “S” terminal circuit. Refer to STR-19, "Diagnosis Procedure". Are these inspection results normal? YES >> GO TO 9. Check that a magnetic switch operation sound can be heard when the ignition switch is set at the starting position. Does magnetic switch operation sound occur? YES >> GO TO 10. Check condition of pinion and ring gear mesh. • Adjust pinion movement. Refer to STR-24, "HR16DE : Inspection and Adjustment" (HR16DE) or STR-30, "MR16DDT : Inspection and Adjustment" (MR16DDT). • Check pinion moving mechanism. NO >> Repair or replace, if necessary. Check that the starter motor runs when connecting the positive terminal (12 V) to starter motor terminal M and the negative terminal (ground) to starter motor body. Does the starter motor run? YES >> Replace magnetic switch. NO >> Repair starter motor.